A) Domain Constraints: can be violated if an attribute value is given that does not appear in the corresponding domain (allows only permitted values). B) Key Constraints: can be violated if a key value in the new tuple„t‟ already exists in another tuple in the Relation r(R) [avoids duplicate entries]. C) Entity Constraints: can be violated if the primary key of new tuple‟t‟ is NULL (avoids NULL values). D) Referential Integrity: can be violated if the value of any foreign key in„t‟ refers to a tuple, that does not exist in the referenced relation [foreign key values should match with primary key values]. E.g. : insert into emp values (1, john….etc.) into emp – acceptable. not acceptable because same eno already exist in the employee relation, violates key constraints. insert into emp values [null, raj….etc] into emp. not acceptable because null for the primay key eno; it violates entity integrity constraints. not acceptable because it violates referential integrity constraints specified on dno, no department tuple exists with dno = 70. 1) It is used to delete tuples. Delete operation can violate only referential integrity if the tuple being deleted is referenced by foreign keys from other tuples in the DATABASE. To specify the deletion, a condition on the relation selects the tuple to be deleted. 2) 3 options are available if a deletion operation causes a violation. a) The 1st option is to reject the deletion. b) The 2nd option is to attempt to delete the referenced tuples, when link data field is deleted. Delete the emp tuple with eno. = 5 – this deletion is acceptable Delete the dept. tuple with dno = 10 – this deletion is not acceptable because tuples in emp refer to this tuple. Referential integrity violation will result. 2) It is necessary to specify a condition on the attributes of relation ‘R’ to select the tuple/s to be modified. 3) Modifying an attribute that is neither a primary key nor a foreign key usually causes no problems. The DBMS only needs to check to confirm that the new value is of correct data type and domain. 4) If a foreign key attribute is modified, the DBMS must make sure that the new value refers to n existing tuple in the referenced relation. E.g. : modify the no. of the department tuple with dno = 10 to 40 – not acceptable, because it violates referential integrity. Relational algebra operations are divided into two groups. 1) Set operations like union, intersection, difference, and Cartesian product. The <selection condition> is a Boolean expression, consists of attribute names, comparison operators like =,!=,<,<=,>,>= and Boolean operations like AND, OR and NOT. E.g. 1. Select the employees who are working in department 10, and whose salary is greater than Rs.5000. E.g. 2. Select the employees who are working in department 10 and earning more than 5000 or employees who are working in department 20 and whose earnings are more than 8000 rupees. degree (number of columns) of the result is equal to the number of attributes specified in the attribute list. Eg 1. Select the name and salary of all the employees. Eg. 2. Select names and addresses of all employees working for department 10. These are used to merge the elements of two sets in various ways, including union, intersection and difference. Three of these operations require the table to be union compatible. The two relations are said to require the table to be union compatible. The two relations are said to be union compatible if the following conditions are satisfied. 2. Each column of the first relation/table ® must be either the same data type as the corresponding column of the second relation/table(s). The intersection operation selects the common tuples from the two relations. The result of this operation denoted by RÈS, is a relation that includes all tuples that are either in R or in S or in both. Duplicate tuples will not appear in the output. The relation R has 2 columns and 3 tuples. The relation S has 2 columns and 3 tuples. So the Cartesian product has 4 columns (2+2) and 6 tuples (3 x 2). The Cartesian product operation applied by itself is generally meaningless. It is useful only when followed by selection and projection operations. r(rho) is used to denote the rename operator. In some situations, it is better to break down a complex query into two or more simple querys. We must rename the relations that hold the intermediate result relations. It improves the readability and facilitates better understanding. 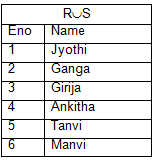 1. rs(new attribute names)(R) – It renames both the relations and its attributes. 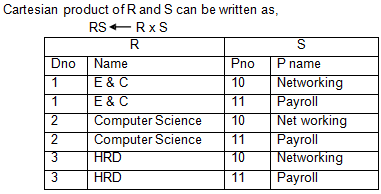 2. rs® – It renames the relation only. 3. r(new attribute names)(R) – It renames only the attributes. Here S is new relation and R is original relation. This example renames relation employee into relation E.
Ex.2: To retrieve the employee number and name, who are earning more than 5000 Rs. Here intermediate result stored in Esal. Join (´): The capability of retrieving data from multiple tables using a single SQL statement is one of the most powerful and useful features of RDBMS. It is the availability of join operation. We know that one table may not give all the information about a particular entity. The join operation, denoted by ´ is used to combine two relations to retrieve useful information. A join operation matches data from two or more tables; based on the values of one or more columns in each table, it allows us to process more than one table at a time. For e.g. : The employee table gives only the department id’s, if we want to know the department name, then we have to get the information by joining employee table and dept. table. In join, only combinations of tuples satisfying the join condition appear in the result. For example by joining employee and department relations, we can get the name of the department in which the employee is working (department name exists in department table). Where emp.deptno = dept.dept_no and emp_no = &emp_no. The first operation in the joint operation will combine the tuples of the employee and department relations on the basis of the dept no.to form a relation called emp_dept. Then the PROJECT operation will create a relation RESULT with the attributes eno. Ename, and dname. To perform join between two relations, there should be a common field between them. Where each condition is of the form Ai 0 Bj (dept.deptno = emp.dept_no). Ai is an attribute of R and Bj is an attribute of S. Ai and Bj have the same domain (same values) and 0 is one of the comparison operators (=,<,<=,>,>=,!=). A join operation with such a general join condition is called a "Theta join". Equi Join: While joining if the comparison operator is = then it is equijoin. Eg. Select emp_no.ename.dept.dname from emp.dept. Where emp.deptno = dept.dept_no. 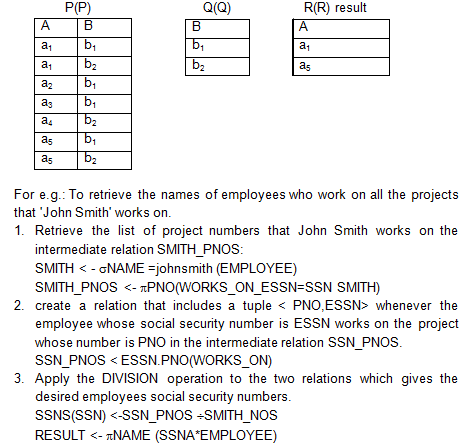 Here list l specifies list of attributes from R and list2 specifies a list of attributes from S.
Here, the joining is done over the attribute DNumber of Department relation and DNum of Project relation. In fact, DNum of Project is a foreign key which references DNumber of Department. Generally, in a natural join, the joining attribute is implicitly considered. Suppose the two relations have no attribute(s) in common, R S is simply the cross product of these two relations. Joining can be done between any set of attributes and need not be always with respect to the primary key and foreign key combinations. The expected size of the join result divided by maximum size i.e. nR nS leads to a relation called join selectively. 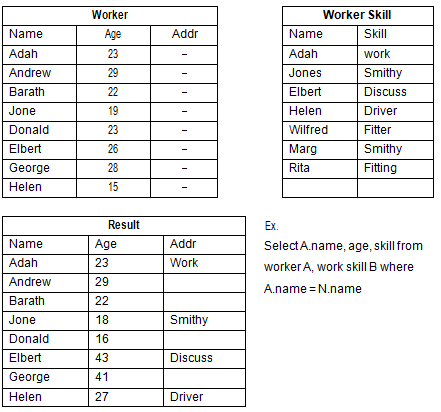 In the above example even though there is no matching row with B name, all workers are listed along with age and skill. If there is no match, simply get an empty skill column. The outer join can be used when we want to keep all the tuples in R or in S; those in both relations, whether or not they have matching tuples in the other relation. Left outer join: It is denoted by . The left outer join operation keeps every tuple in the first or left relation R in relation R S. If no matching tuple is found in S in the join, result is filled with null values. Full outer join: It is denoted by and keeps all tuples in both the left and right relations and when no matching tuples are found, filled with null values as needed. occasionally it may be used to solve certain kind of problems. 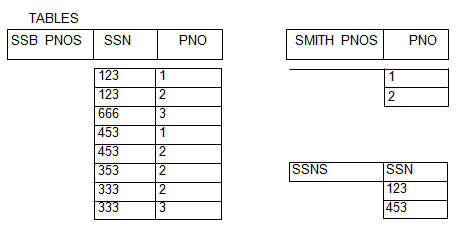 Notice here that 123,453 appear in SSN_PNOS in combination with all two tuples in SMITH_PNOS; that is why they appear in the resulting relation SSNS. It is often required in data base applications to find an aggregate value over some column (to find summation). For example, we may wish to find the sum of salary drawn by all the employees, or to find the total number of employees working in a department etc. for which aggregate function can be used. It is also useful in grouping the tuples in a relation by the value of some of their attributes, and then applying an aggregate function independently to each group. Commonly used aggregate functions are sum, average, count, maximum and minimum. For example: Group employee tuples by dno, so that each group includes the tuples for employees working in the same department; after that we can apply aggregate function to find the average salary of employees within the department. Here grouping attributes is a list of attributes of the relation R, and function list is a list of aggregate functions like SUM.AVERAGE, MIN. MAX, COUNT, and attributes are column names. 1. Partition the relation into groups. 2. Apply aggregate function to each group, output group and aggregate values, one tuple per group. E.g. : To retrieve each department number, the number of employees working in the department and their average salary. Resulting relation has the grouping attributes in addition to one attribute for each element in the function list.